Children’s birthday parties are usually held on Saturdays. For best available dates, we encourage you to book three or more weeks in advance for weekday parties and a month or more in advance of Saturday parties. Since small children can become quite tired after a busy school day, we do not recommend evening parties for them, but are always happy to accommodate you with an after-school party. We do try to accommodate our party hosts by offering suitable party times for everyone, and we have found after hundreds of parties, younger children tend to do better at our earlier party time slot of 10:30am-12:00pm. We also offer afternoon parties Monday thru Saturday between 1:30 and 3:30pm, and generally older children prefer this time of day. To reserve your party date and time for Children’s Parties we request advance payment of the party fee (non-refundable). Our Party Fees are as follows: $60 for 2 hours; $75 for 2.5 hours; $90 for 3 hours. Our party fee covers the party room space and provides you with our party specialists that are dedicated to prepare, assist your group, and clean-up after the party. Party fee is non-refundable and is NOT applied to the per guest fee/final bill. Larger parties (greater than 10 guests) will run approximately 2 1/2 to 3 hours. To make sure your party goes as planned, we schedule our staff and purchase merchandise according to our party calendar, therefore all deposits are non-refundable and no store credit will be issued for parties cancelled less than 30 days prior to the event. Credit card fees of 4% will be deducted from refunded deposits where applicable. *Parties are to end by 3:30pm due to store closing time of 4:00pm; parties will be scheduled according to ACTIVITY time. Please call for available times for larger parties. In addition to the party fee, the party host will be billed at the end of the party for each guest times the dollar amount of the project selected. All guests at the party will do the same project that has been pre-selected with room for expression of individual style. Party guests will keep the projects they make. 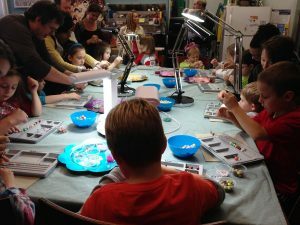 For a detailed list of our Jewelry Making Party Activities click here. Party set-up is included in your package and you may arrive early to prepare, decorate, and greet your guests. We recommend 15 minutes to set up and are happy to assist you (please let us know in advance if you require more time). We think balloons are fun and fabulous but ask that you choose Mylar (foil) and/or other non-latex types due to latex allergies (please note, we have a staff member that is allergic to latex). To eliminate distraction and ensure proper beading etiquette we ask that all food and beverage be served after we have completed the beading session of your party. If you prefer to enjoy your refreshments prior to beading please let us know. All food and beverage items are provided by the party host and/or their guests. As there are many food allergens we may not be aware of for each child, we are not able to provide these items. We encourage party hosts to communicate with parents to ensure dietary needs/restrictions are addressed. We kindly request that whenever possible, you serve cake with plates and a fork as cupcakes tend to become a bit messy. Juice boxes and water bottles are preferable to cups. We would also appreciate it if you would not bring crackers or popcorn. Please do not bring any peanut items as we try to keep our party room free of nut-allergens (please note, we have a staff member that is allergic to peanuts). We do not provide paper products and serving utensils as many children love to choose their own themed decor. Our cake stands and display items are available for you to use during your party. For our party room audio, we use Sonos and can play any style radio station you prefer (Slacker, Pandora, etc) device for your enjoyment. 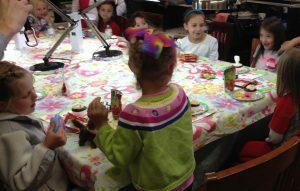 Our party room is located upstairs, and our activity table accommodates 16. If you have more that 16 guests or guests that cannot make the stair climb please contact us to set up an after-hours party on the main floor when the store is closed to the public.